What is better than discovering promising talents, who despite their often limited professional experience, yet they have a capacity to create, equal to that of recognized and experienced creators. Creating a collection is not just about making impressive clothes. Neither just about making garments that are comfortable and easy to wear. The starting point is always the inspiration. The question to be answered is always whether the outcome reflects the inspiration in the best possible manner. The cuts, the fabrics, the materials, the colors, the embellishments, they all add a little something to conveying the starting point; the inspirational stimulus. 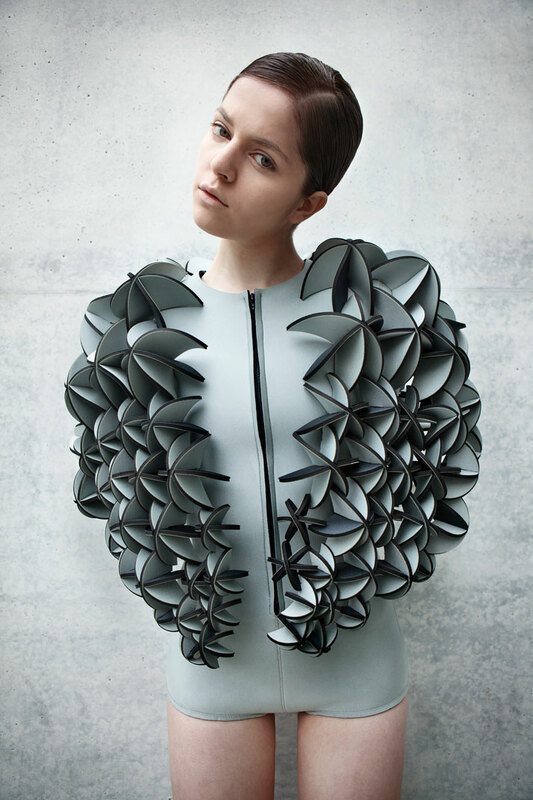 “Synthetic Oceans” collection by Alba Prat ; a promising, final year, fashion design student from the University of Künste, Berlin, represents the transition that the aquatic world experiences as a result of the industrialization era. As thousands of tons of plastic are dumped in the ocean every year, the seabed has been transformed into a contaminated and lifeless place, where sea creatures are struggling to adapt to these non-natural circumstances. The endangered living organisms must adapt or else will die. The collection conveys this ‘cold and dark atmosphere where the beauty of the mutations and the defense mechanisms that its inhabitants embrace is to be seen’. 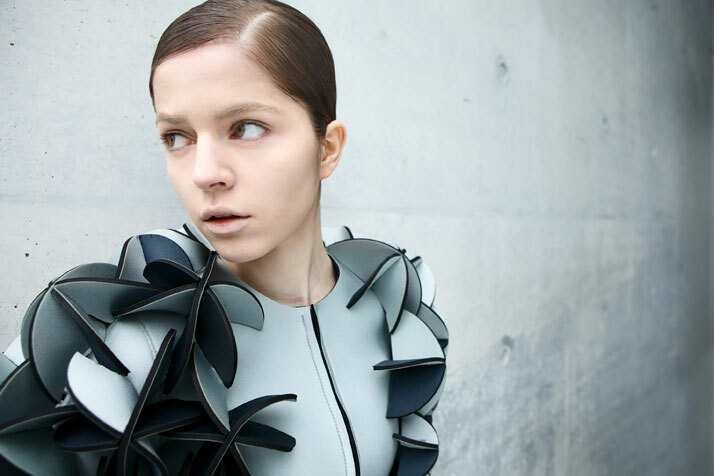 The project features two suits, both made of laser-cut, neoprene fabric conveying the futuristic synthesis of the collection. 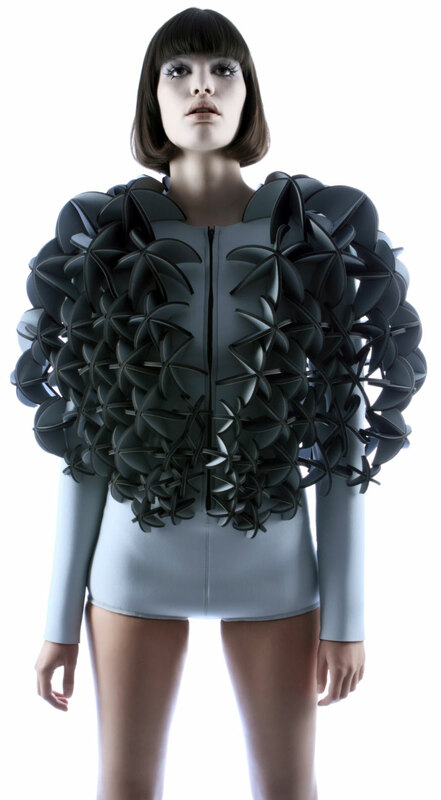 The use of neoprene fabric, a chemically based material, is used in these pieces mainly due to its trait to insulate against the cold of the deep waters, referring back to the inspiration of the collection. Partly resembling the cubist movement, prominent trend of this season, the line features clean cuts and shapes in garments combined with chunky wedge boots. The color palette is grey and silver based conveying the mood of darkness and erosion. Alba Prat’s collection comprises a very promising step from a young designer with a huge potential. We now long to see her next move which we are sure will follow the same footsteps resulting to an even better outcome.